Second edition, published by White Light Publishing, Australia. 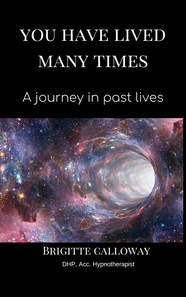 “YOU HAVE LIVED MANY TIMES” is a non-fiction book representing a personal journey of discovery in the field of Past Life Regression under hypnosis. The book is based on the idea that the soul is eternal and travels through many lives in order to learn and teach lessons and ultimately evolve.“YOU HAVE LIVED MANY TIMES” introduces the idea that we are able to recall memories from past lives because of the brain’s structure and the way it functions, as well as the memory imprint of individual cells. Therefore, the book invites the reader inside of the human brain and hypothesizes how individuals are able to remember memories from the present life and even from other previous existences that our soul incarnated to.“YOU HAVE LIVED MANY TIMES” focuses on several real past life regressions cases, recorded in the author’s Hypnotherapy practice. The clients’ regressions, some face-to-face, others group regressions or even distance regressions, are conducted under deep hypnosis. Click on your location to buy "You have lived many times"